If you’re interested in casinos then you are probably aware of this specific developer. 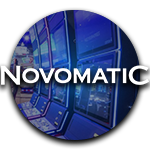 Novomatic is possibly the number one classic casino brand in the world, at least when it comes to machines and slots. They have created hundreds of different games over the years and they are responsible for some of the most famous titles in gambling history. This iconic Austrian brand has been making games for decades. They started off in the early eighties with cabinets, poker machines and automatic table games, which spread to every corner of the world in a matter of just a few years. Their games became dominant in pretty much every European country and beyond. But that was a long time ago. These cabinets have been upgraded a lot since then, which means they now supply state of the art equipment to casinos and gambling halls in more countries than you can count! This includes multi-screen slot machines and gambling sets which include remarkably comfortable chairs. Would you like to try one of them? Then simply visit a land-based casino in your region. Chances are that they will have a number of different cabinets which were provided by this particular developer. Do you prefer playing online? Then there are also numerous reliable online casinos that you can visit. A remarkably large number of slots has been digitalised at this point, meaning you will get to experience pretty much every single one of their classic games in the comfort of your own home! The games that were made by Novomatic have gone online, but they use a different brand for slots on the internet. Greentube is the company that is owned by Novomatic which digitalises their products and that is also why this specific name is mentioned whenever you open one of their games at an online casino. In other words, Greentube slots are the same as Novomatic slots, except they’re online. As mentioned before, there are loads of different games to be found that were made by this developer, but some of them are a bit more famous than the rest. Probably the number one videoslot that was made by Novomatic is called Book of Ra. You have probably seen it on advertisement billboards in airports, hotels or casino strips, and if you like to gamble then there is a very good chance that you have played it before. As you can tell from the name, this slot has a classic Egyptian theme, but it also has some very original bonus features. The basics are the same as those in most other slots… But just you wait until you hit the free spins! At that point you will get to make winning combinations from the left to the right, except the reels don’t need to be adjacent, and special bonus symbols will expand over the entire reels as well! Book of Ra became so successful that they upgraded it in several different ways. This led to the release of games like Book of Ra Deluxe with upgraded graphics, Book of Ra 6 with six reels instead of five, and Book of Ra Jackpot, which of obviously also offers a feature which will let you win a jackpot on top of your regular winnings. But there are other Novomatic slots that have become quite famous as well. For example, the cheering fruits from Plenty on Twenty can be heard in the halls of many casinos, while Lucky Lady’s Charm and Sizzling Hot also both deserve a place in the hall of fame. And if you like to gamble online then I’m sure that you are familiar with Starburst, which was created by Net Entertainment? That game is actually a direct copy of Power Stars, which is also one of Novomatic’s most famous creations! If you’ve never actually heard of any of these games before, but you are interested in playing the games that were made by this specific developer, then I can give you a useful tip on how to find them in any land-based casino. You can of course check every machine for the Novomatic brand, but in this case, it might actually be more useful to follow your ears instead of your eyes. Because pretty much every single one of their slots uses the same sound effects, with a mechanical sounding clicking noise whenever a reel stops spinning, and a repetitive bleeping melody which keeps repeating itself while you are playing. If you want to hear what this actually sounds like then you can simply visit an online casino that offers their slots and try one out for free. You might want to start with one of the games that were mentioned above, because they became that famous for a very good reason.